Japanese ancestors since ancient times used to believe that divine spirits descend riding on horses. From this belief a custom of offering live horses to the gods during rituals and prayers has emerged. It appears that this custom later evolved from the offering of live horses to offering clay and wooden horses, so-called standing horse boards and pictures on boards, leading to present day votive tablets. 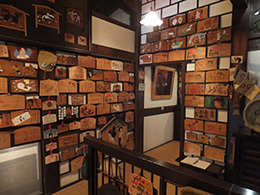 Konpira Emakan Museum is the first ema votive tablets gallery that was opened in 1976, after reconstruction of the old Ema Hall carried on with care not to damage the original beauty of its architecture, to preserve and display ema votive tablets that are samples of Japanese original religious art. Since there is a trend to regard ema votive tablets as forgotten cultural assets we would be glad if our hall became a good opportunity for visitors to view the art of original Japanese Ema votive tablets. In the room a 19 century Art Nouveau (Émile Gallé, Nancy Daum), Art Deco (René Lalique), Paste of Glass Technique (Emeric Walter, Argy-Rousseau). 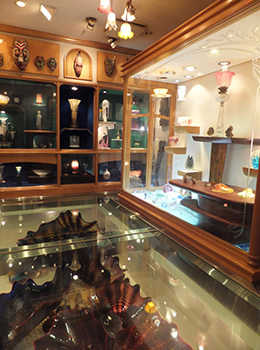 The masterpiece of the collection is a monumental work by contemporary American Industrial Artist Dale Chihuly called “The god of the sea” (made especially for this room) which is to be viewed through transparent floor 3m x 4m in size. Huge pieces of shellfish shaped glass art overlap one another creating mysterious beauty and overwhelming power. Refer to the website below for details concerning Dale Chihuly. This hall facing a Japanese garden is widely available to the public and is open for rent as a meeting place of constructed in a pure Japanese style. 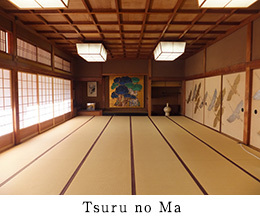 It is suited for presentations and rehearsals of various performing arts, an exhibition room for Japanese Kimono and as a place for conducting various classes. It is conveniently located only 1 minute walk from city bus stop “Higashiyama Yasui” or a 15 minute walk from “Gion Shijo” station of Keihan railway, as well as “Kawaramachi” station of Hankyu railway. There is also has a parking space available for those visiting by car. To apply for rent or to ask for details contact the shrine office. 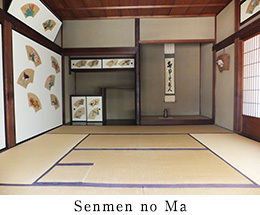 This is a spacious hall size of 30 tatami mats facing a garden on the south side. The alcove is decorated with a work of pine, bamboo and plum by Momokazu Shinohara and on the sliding doors there are paintings of one thousand golden and silver cranes. Japanese style room facing a garden, of 10 tatami mat size. As there is a place cut out for a fireplace, it is naturally suited for tea ceremony, but is also suited for gatherings of haiku poets or other meetings with small number of participants. The sliding doors and door pockets of alcove shelves are everywhere decorated with fan paintings of nature pictures painted by the artist Genbei Kamei. 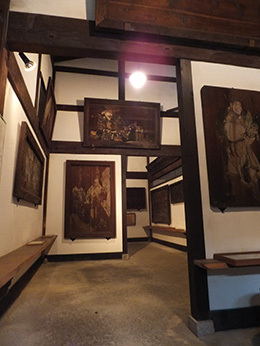 There are 2 rooms size of 6 tatami mats, with scenes from famous Tale of Genji expressing the seasons painted on the sliding doors.